At Casa Padrino, you are in the right place if you are looking for passionate luxury glass showcases for your home oasis of well-being or your business premises. 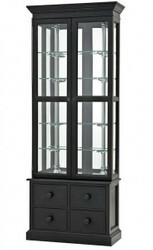 Just browse a bit in our Luxury Glass Cabinets category and find exactly what you are looking for. 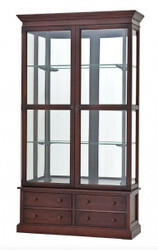 Whether it's framed photos, collectible or decorative pieces, a glass cabinet brings out the things that matter to you and hides what you want to have at hand, but not always in view. 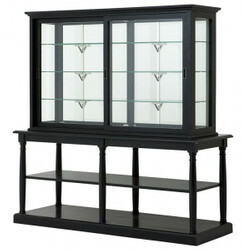 A display case not only offers the opportunity to stage favorite pieces with its glazed compartments, but also protects against dust, a decisive advantage in contrast to open shelves. 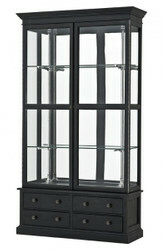 In addition, showcases through the glass inserts less massive than closed cabinets or wall units and are therefore also recommended for smaller living and dining room. Professional advice and top service are a matter of course for us at Casa Padrino. Therefore, our employees bring with them a great deal of competence and experience. 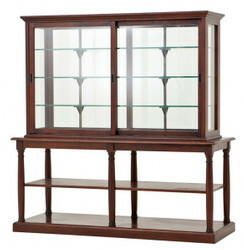 If you have decided on a suitable product, we take care of a professional shipment of the goods. If you have questions about the product, you can contact us by phone at our customer service. Our friendly will gladly help you. Online shopping is fun!